The A.C.E. is available in a basic white model with accent stripes, and two new 2012 optional exterior full-body paint schemes – “Twilight Dawn” and Summer Breeze” – shown here. 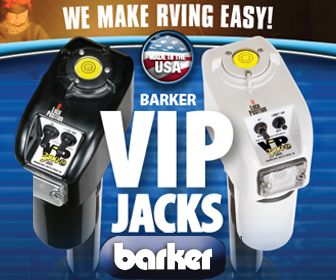 One of the most exciting new developments in the RV industry is rolling onto RV dealer lots throughout North America. It is the logical evolution of the state-of-the-art in motorhome design – a melding of the best attributes of the class A motorhome concept with the compact affordability of the class C models. 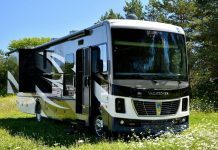 It is, as the engineers at Thor Motor Coach describe, the ideal combination of the drivability, interior space, and fuel economy of a compact class A motorhome, with the interior features and maneuverability of the class C design. That is why the units are called A.C.E. – an acronym for A and C Evolution. One aspect of the vehicle that has been misunderstood is the media references to the A.C.E. 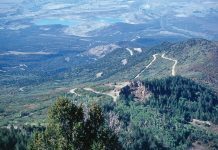 as a “hybrid” True, it is a hybridization of class A and class C motorhome design, but in today’s automotive environment, the term hybrid generally refers to the propulsion system – as in the new wave of hybrid gas / electric vehicles. The A.C.E. is a gasoline-powered vehicle – we have not heard of any plans to develop a hybrid-powered version, although the concept is quite tantalizing. On the road, the A.C.E. is a pure pleasure. Stable, peppy, and fun to drive, it is very easy to get used to. You can cruise all day long in perfect comfort, and your passengers enjoy a ride that is smoother and quieter than a class C motorhome, but not as yachtlike as the larger class A motorhomes. The A.C.E. has a 5,000 lb. 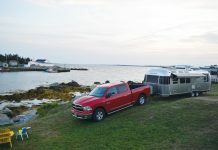 towing capacity – ideal for boat, ATV, and motorcycle enthusiasts… you could of course, pull a car for convenience touring at your destination, but the A.C.E. 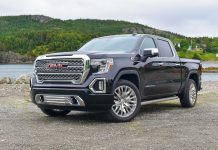 is compact enough for comfortable driving in and around most cities. Some of the best design features of the class C category are incorporated into this very clever new species of motorhome. For example, the windshield is contoured so that there is a bit of an overhang from the roof profile – this provides a natural sun shade, without diminishing the view from the cockpit. The aerodynamics of the front end of the motorhome direct the airflow to the sides of the vehicle, cutting the wind much more effectively than the class C designs. 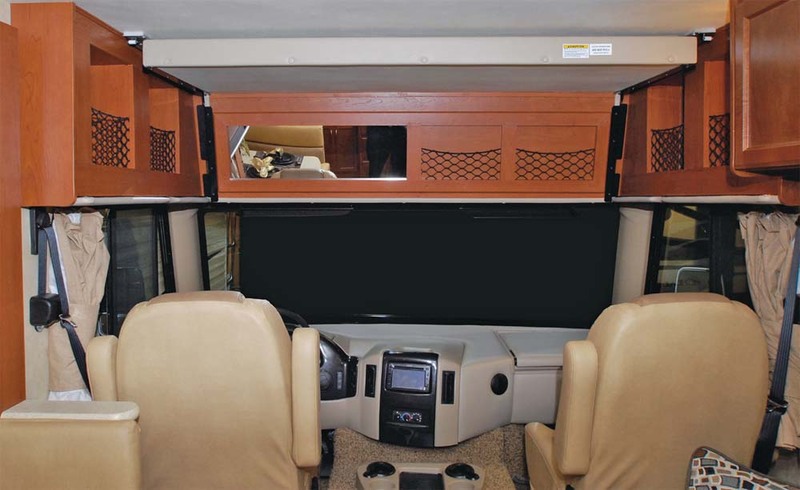 Inside the A.C.E., the most obvious design element that has evolved from the class C units is the electric fold-away front overhead bunk – a very popular feature of all class C models. In the A.C.E. the front bunk is mounted on an electrically powered frame that can be raised or lowered at the touch of a switch. 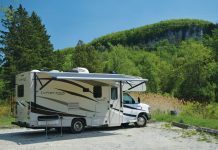 Outside, the features that you would expect to see on a larger class A motorhome are available – cavernous exterior storage compartments, including a rear pass-through that can hold items up to 8 feet long. There is even a window at “pet level” so your dog or cat can lie on the floor in front of the navigator’s seat and enjoy the view. The A.C.E. is built to last with a fully welded tubular floor, wall and roof structure. The 13.5K BTU roof air conditioner is ducted for quiet comfort, and there is a standard 3600-watt generator for “boondocking” convenience. 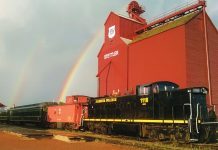 Popular options include leveling jacks, a second auxiliary battery, back-up camera system, a 15K BTU roof air unit, and a 4000-watt generator. Our test vehicle was one of the standard exterior designs, basically a white model with accent decals, but the two optional fullbody paint schemes are beautiful, and well worth the extra investment in terms of pride of ownership and resale value down the road. Inside the vehicle, the standard leatherette captain’s chairs and sofa and dinette seating are very comfortable, and the selection of components and materials is quite appropriate for a vehicle in this price range. We like the residential linoleum flooring, and the easy-clean vinyl ceiling. The cabinetry is cherry, with nickel hardware, and all of the drawers and cabinets are well built and nicely finished. When we visited The Hitch House, in Shanty Bay, Ontario, to test-drive the A.C.E., there were two models available, the EVO 29.1 and the EVO 29.2. While both models handle exactly the same, the difference in the interior floor plan is quite different. We spent some time at the recent Toronto RV Show talking to visitors who were touring the motorhomes, because we could not decide which floor plan we preferred. The EVO 29.1 has a dinette and stove in the slide-out, and a compact L-shaped galley counter against the bulkhead; the 29.2 has a longer slide-out with a larger galley countertop beside the dinette… this gives you a wider aisle for easier access to the rear bedroom. Which floor plan is preferred by the people we spoke to? Sorry, they liked both! 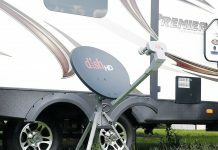 One of the best features of the class A category is the use of dedicated exterior compartments for the RV system hook-ups. The A.C.E. features this convenience, with a special compartment where you can store your sewer hose, instead of trying to stuff it into the rear bumper. There is a very large rear “mega-storage” compartment on the passenger side of the vehicle that should accommodate most of your gear. Other storage compartments on the curb side of the motorhome are convenient, and sized appropriately for a compact class A unit. 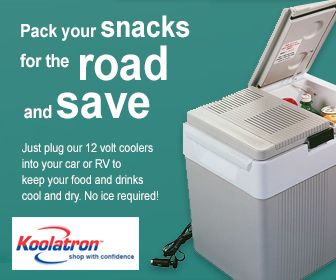 All of the RV system hookups, and major appliance access panels are located on the driver’s side of the vehicle. The A.C.E. 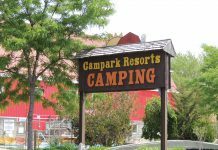 has a 14’ awning that transforms the vehicle into a shady corner of paradise in the campground setting. If you go for the power awning option, all it takes is the touch of a switch. Every available space has been utilized in this new motorhome concept. We especially liked the storage drawer and utility compartment incorporated into the entry steps, exactly where we like to keep a pair of gloves, flashlight, and a few basic tools for fast and easy access. 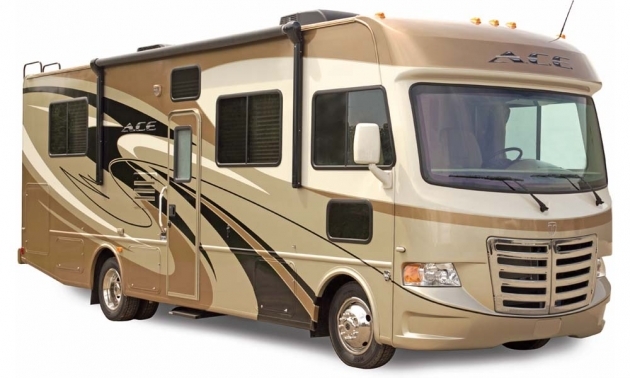 As a compact class A motorhome, the A.C.E. 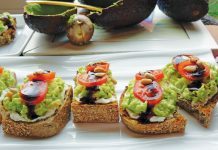 incorporates all of the essential residential features. The floorplan options in both the 29.1 and 29.2 models include the front lounge and dinette and the very impressive front overhead bunk. With a residential style porcelain toilet, vanity sink, and lots of cupboard space, the A.C.E. 29.1 washroom is well designed. The shower is across the aisle – so two people can use the facilies at the same time. From the dinette to the rear of the unit, however, there is quite a difference between the vehicle interiors. 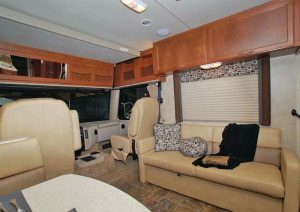 The model 29.1 has an L-shaped galley and a small galley countertop that shares the slide-out section with the dinette. This facilitates having a distinct separation between the rear bedroom and the “living room” area. The 29.2 floor plan has a larger slide-out section, with a galley in the slide-out. This results in a more spacious overall layout, with a line of sight from the driver’s seat right back to the rear wall of the motorhome. 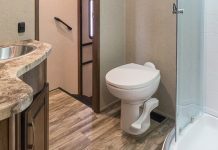 The washroom in floorplan 29.1 is split into two sections – the sink and toilet are on the driver’s side of the vehicle, and the shower is across the aisle. In the 29.2 floor plan, the washroom is a single compartment, with sink, shower and toilet. If you travel with a pet you will love the “kibble station” – a special floor-level drawer that holds food and water bowls. 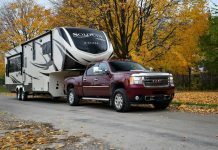 For those who are looking to move up to a class A motorhome that is designed for 21st century touring, or experienced RV’ers interested in downsizing to a more compact and fuel efficient unit, the A.C.E. 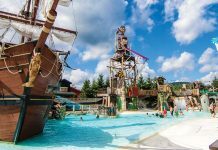 is at the top of our “must see” list. 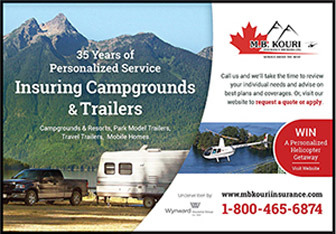 A very fine handling vehicle that suits the needs of a wide cross section of Canadian RV families.